I must admit, the first time I bought a bare root rose, it scared me to death. I just knew I would kill it. It looks scary. It’s really not when you break it down into steps and work carefully and deliberately until the job is complete. Dig the hole at least 6 – 8″ deeper and wider than the root system of the rose. Notice in the picture large and then small fibrous type roots. The fibrous roots are feeder roots. Do not remove them, they are essential for taking in nutrients to the plant. Pour a gallon of water in the hole. If the water dissapates within an hour, you are good to go. A. Dig deeper 8″ – 12″ and fill up the space with garden soil and pine bark mulch nuggets to promote drainage away from the roots. B. Select another spot with better drainage. C. Consider a raised bed to grow your rose in. Using equal parts garden soil and composted manure and make a cone in the center of the hole. Bare root rose systems resemble the inside of an open umbrella. The goal with the cone is to fill in the open space that will exist when you place the roots in the hole. 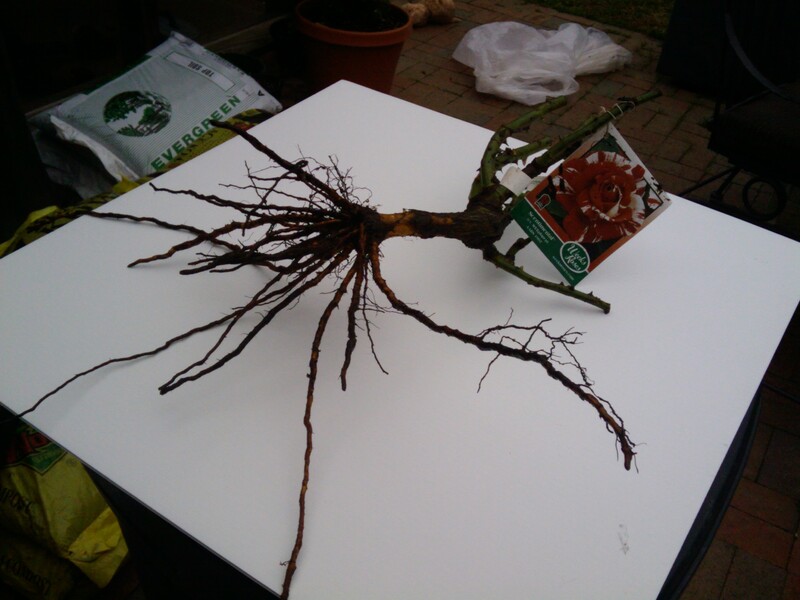 Once placed, continue to fill in around the root system until the area inside root system is filled. Make sure that no gap exists. If so, your rose will likely not do well. Continue filling the remainder of the hole up to the top of the hole. Depending on your zone, the graft union may need to be below the ground. Here in zone 8a, I plant my roses with the graft union just above soil level. Once covered, gently tamp down the soil and water in. Mulch will help retain moisture and keep down weeds. About 1″ – 3″ layer of mulch is suggested. I tend to mulch heavily. Observe your rose as it begins to grow. Watch it’s growth habit and cycle of bloom. You will be suprised at the joy that comes when you see your first blooms! A note on fertilizing: Wait until your newly planted rose begins to put out new growth before you apply additional fertilizers. I am a big fan of organic fertilizers and have used several over the years. I have found one in particular that has yeilded excellent results. Haven Brand soil conditioners are awesome for feeding your roses and other garden plantings. No, I am not a spokesman for this product, just a satisfied customer. Great information. I wish I knew this when I planted my brother’s rose. This is really useful – thank you. I have a question – are there any advantages (other than cheaper postage) to buying bare-root roses over container roses? I have heard bare-root do better, is this true? It seems counter-intuitive to me.